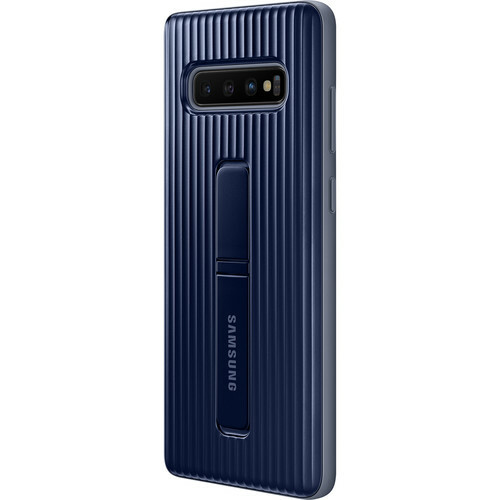 The navy Rugged Protective Cover for Galaxy S10+ from Samsung is designed to be a case that offers shock and drop resistance with a MIL-STD-810G military tested build. This case also features a built-in kickstand that allows you to position your phone in an upright landscape orientation for hands-free viewing. The kickstand offers two different viewing angles and can blend seamlessly into the back of the case when not in use. This case also features precision cutouts to provide easy access to your cameras, buttons, and ports. The Rugged Protective Cover's drop-tested build defends your Galaxy S10+ against damage caused by drops and falls. This case is designed to offer heavy-duty protection while still allowing you to see the entirety of your Galaxy's Infinity Display. The built-in kickstand holds your phone at an optimal viewing angle and folds flat into the back cover. Box Dimensions (LxWxH) 9.1 x 5.2 x 5.1"
Rugged Protective Cover for Galaxy S10+ (Navy) is rated 3.3 out of 5 by 8. Rated 3 out of 5 by LLCoach123 from NOT EXACTLY RUGGED This cover is a good cover but it is definitely NOT rugged. The material is not very thick at all and not sure if it will hold up on the corners if dropped on one of them. It does fit extremely well and having 2 kick stands is a bonus. Just hope it holds up and protects my new S10+. Rated 1 out of 5 by LoganMorty from terrible case this case provides literally no protection at all. My brand new s10 plus fell off a 2 foot tall coffee table and the screen shattered. do not buy this case. Rated 5 out of 5 by SSDeletedMy1stRVW from light weight protection I bought this to replace the leather cover and it is so much better. It adds a good grip for the phone and much better protection without being too bulky. Plus it has dual kickstands. Rated 1 out of 5 by MrChomusPR from Doesn't look Rugged or Protective Compared to the Samsung Rugged Protective Cover for the Note 9, this one is super thin and small, is not really rugged at all. Samsung needs to make this cover really rugged. Rated 5 out of 5 by Michael from Pretty good so far... Ive only had the case for 2 weeks. So far so good. Ive only dropped the phone once so not a real good sampling size to test protection ability. What I do really like is that the case is really well fitting and doesnt increase the size of the phone. Fits nicely in my pants pocket. Also the kick stands in the back are very useful when I want to watch video on a flat surface. Holds the phone up in a nice viewing position. Rated 5 out of 5 by Jano from Great case Feels great in the hand, looks high quality. Its a nice balance of protection without adding alot of bulk.